Sparkling wine is white wine with enough levels of carbon dioxide to make the drink bubbly. Sparkling wine produced in the Champagne region of France is called champagne. The Madrid Treaty of 1891 gave France legal protection against the use of the name Champagne for sparkling wine produced anywhere else in the world. Sparkling wine may be produced by any of the methods including carbonating normal wine and seal the bottle which is actually the same process of making soft drinks. However, Champagne is made strictly in accordance to the regulations and procedures approved by ComitÃ© Interprofessionel du Vin de Champagne (CIVC). More and more countries are signing trade agreements with the European Union to protect and stop the usage of Champagne in their countries. This has curbed the usage of the name champagne and most wine producers worldwide have started calling their produce sparkling wine. 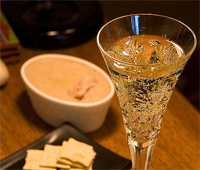 The most common method used in France for producing is by ‘methode champenoise’ or the champagne method. This process basically consists of the secondary fermentation happening in the bottle. After the primary fermentation and bottling certain amount of selected yeast and sugar are added in the bottle and it is closed with a crown cap. The wine is then left to age for a minimum prescribed period. On completion of this period the bottled are taken out and placed in special racks at a 45 degrees angle. They are taken out every few days and slightly shaken and then replaced in the racks at a slightly steeper angle. This process continues till the bottles are pointing straight down. This process ensures that the sediment of the yeast settles in the neck. The neck is then frozen and the cap removed pushing the sediment out. The bottle is quickly toped up and corked. Champagne has long been associated with a luxurious lifestyle and celebration, however, wine is used as a normal everyday drink. The phrase sparkling wine really does not invite the same feelings as champagne does. It has been probably this difference that has lead to France insisting on protecting the usage of the word. 1.Sparkling wine is any white wine with bubbles while Champagne is sparkling wine produced in Champagne region of France. 2.Sparkling wine may be produced by any of the methods while Champagne is produced by the Champagne Method. N Amit. "Difference Between Sparkling Wine And Champagne." DifferenceBetween.net. July 16, 2018 < http://www.differencebetween.net/object/difference-between-sparkling-wine-and-champagne/ >.